Powerful, shimmering surf and instrumental rock from the East Coast's best instro-rock trio -- nothing but summer, surf and lightning-fast Stratocaster action. NOR’EASTER is the third -- and best -- studio release by the East Coast’s best, fastest and most creative surf/instrumental trio, Mister Neutron. NOR’EASTER is basted in everything that makes this band so freakin' special: creative, original modern-surf melodies, lightning-fast playing and a subtlety and tightness that come from having played together for 24 years. Thrill to the ferocious double picking, the chilling glissandos and the trem-bar bends! Gawk and grin at some of the best instrumental rock of the Nuclear Age! Yes, it's that good. NOR’EASTER showcases several instro-rock styles, including modern and classic surf, a slack-key-inspired acoustic tune, Hammond-organ-drenched spy rock and spaghetti western via a new arrangement of “Hang ’Em High” from the Clint Eastwood film of the same name. And although it’s packed with East Coast references (Point Pleasant, Sea Girt, Tiki Barber), NOR'EASTER will have people doing the Neutron Stomp from coast to coast, down into Tuscany, Antigua, Weisbaden and Indochina! Maybe even Rockville, Maryland! NOR’EASTER is the perfect soundtrack to everything – and, yes, we mean EVERYthing – you'll do this summer. MISTER NEUTRON has been playing together since Aug. 11, 1984, when they all sported moptops and bad T-shirts. The band is Damian Fanelli (guitarist and writer – check out his Dave Wronski feature in the February 2008 issue of Vintage Guitar magazine -- see the LINKS, below left), Tony Fanelli (bassist and lover of fine things) and Drew Paradine (drummer and champion mouser). They all live in New Jersey. 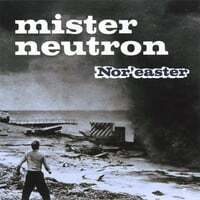 During their 10-year lifespan, MISTER NEUTRON performed in New Jersey, New York, Pennsylvania, California, Texas, Massachusetts, Connecticut, Georgia, Kentucky and Maryland. They might still get together for ONE SHOW PER YEAR at Otto's Shrunken Head in New York City. Visit www.myspace.com/misterneutron for details. From PHIL DIRT at REVERB CENTRAL (our bestest friend in the whole, big, fat, wide, fat world): "The energy and fire are excellent, and the songs very good. PICKS: The Big Island, Tiki Barber, Adriatica, I'm a Geezer for Your Love, Hydroplaning/The Big Island, Naughty Bits. TIKI BARBER: Great drums ramp up this cool song. The approach is infectious, as is the playing. Great playing and feeling throughout. The hand claps add a nice bit of rhythm fluff. HYDROPLANING/THE BIG ISLAND: This is gorgeous! Island beauty and slither, sensual rhythm and beat, and well-balanced sound. You'd have to want to dislike it! The beat is infectious, the gate friendly, and the melody open countryside friendly. Totally cool! From ZILLAGORD/GORDON: "One of the best surf efforts I've heard in a while." From BARRY SIMON of STRANGE BUT SURF: "I love your new CD. 'The Big Island' acoustic is amazing." From JEFF HANSON, aka BIG TIKI DUDE: "An excellent CD all the way!" From ED DiGANGI of HANG DADDY NYC: "Your CD is awesome. Great stuff!" From HAROLD GODWINSON: "The CD is serene yet menacing! I freakin' love it!" P.S. : This line is here in case someone searches for Mr. Neutron (a common misspelling of the band's name). Nor’easter opens with "The Big Island," an acoustic duet by Damian Fanelli and guest Mike Caro. This is a beautiful piece that shows off the depth of creativity of the composer. Thank you for breaking out of the New Jersey barriers that so many seem to want to put around surf bands today. I could definitely get used to this new type of composition from Damian. Caro also makes an appearance on "Vlad The Impala," adding an eerie-sounding organ to the surf cocktail. "The Big Island" is followed by the hard-hitting title song, "Nor’easter." Like its namesake, this storm builds slowly then hits you with powerful guitar playing that knocks you off your feet. The pace at which Damian, Drew and Tony play never lets up. They play faster, faster ... then it abruptly drops off as though it never happened. It’ll take you a while to dig out from the storm surge. Completely different is "Point Pleasant," which has heavy bass lines and a sultry twang that takes your breath away as it slowly dissolves into a quiet sunset. Grab your honey and dance on the sand to this one. But don’t get too comfortable as this is quickly followed by "Stratosfear." Wow! There are a couple of covers, including "Mambo Italiano." Just try to sit still when this comes on; it’ll be impossible. The campy and yet swingin’ conversation between the guitar, bass, drums and percussion is unmistakable. "Neutron Summer" is quickly becoming one of my favorite summer tunes. It’s reminiscent of the trad sounds of decades past, with just enough of a drum line to kick it up to the 21st century. Mister Neutron’s West Coast tours are clearly reflected on "Nor’easter" when you hear "Big Sur Prize," which is no surprise as it’s another rocking original. "Sea Girt Agent Man" opens with some seriously deep dark bass, and it stays put all though the next three minutes. Added to the recipe is the guest Farfisa, which builds the song to nice heights. For you West Coasters, "Nor’easter" is named for the winds that blow in from the North East and drive storms up the East Coast. They are fierce, brutal and can come in with unexpected speed. A truly powerful nor'easter can bring your life to a standstill and make it nearly impossible to get anywhere for days. This CD lives up to its name. I got this CD too and was totally blown away by it. I thought it was a great third release by the band and that it showed a lot of growth and originality. It's a tad on the heavy side on a few of the songs, which some people might not consider to be surf. But I dig the hell out of it. I generally don't review CDs for a couple of reasons: 1. I don't like to. 2. I don't feel it's my place as a DJ to show a bias toward one band or another. But I'm compelled to share a few thoughts on NOR'EASTER (Mister Neutron's third release after MISTER NEUTRON LOVES YOU and RED TRIANGLE). This has got to be Mister Neutron's best by far. It's a combination of speed, power, energy, melody, moodiness, etc. The playing is incredible. I'm sure having seen them live a few times only makes the CD that much more enjoyable. I'm sure the crowd at The Purple Orchid in El Segundo, California, would agree. I know Damian is a huge Slacktone fan, and Dave Wronski's influence is clear in a couple of songs -- much the same as songs by The Razorblades or The Hawaiian Astroboys. But anyone with the ability and talent to play in the same league as Dave has got to be commended. (MN does an incredible cover of "Coffin Closer"!!!) My favorite song off their first CD is, strangely enough, "Hydroplaning," a vocal. On NOR'EASTER, to my delight, they took this song and turned it into a beautiful instrumental, combining it with "The Big Island," making it a “mini-medley." It's just a gorgeous song. I certainly have my favorite releases of 2008, and NOR'EASTER is right up there among the leaders. I really like it -- a lot. There are 16 tracks plus one bonus, so let's say the first half is eight tracks. Within those first tracks is a number called "Hornet's Nest," which I take for granted is a good-natured nod in the direction of Slacktone, Mister Neutron's West Coast friends. But the rest is Mister Neutron the way I've always known them: hard-working and slick as grease. I was hoping for more up-tempo tunes, at which they excel live. The album overall is a little too "pretty" for my liking, but I have to admit the more I hear it, the better it sounds (the mark of a good album, I'd say). When you're offered a whopping 17 tracks, you can't complain too much anyway. Nicely recorded with a live feel to it; not at all overproduced or sterile. We need more young and exciting super-slick surf bands like Mister Neutron for the sake of keeping the scene alive.